Luscious glimmering tropical blooms are accented by smokey, sparkley Swarovski Crystals. These make me think of warm moonlit summer nights and the smell of night blooming flowers as the dew gathers and glitters on all the plants. Luscious glimmering tropical blooms are accented by smokey, sparkley Swarovski Crystals. 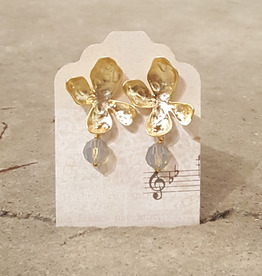 These make me think of sipping coffee and watching the sunrise somewhere warm where I can smell exotic flowers and dew drips off all the plants, sparkling. 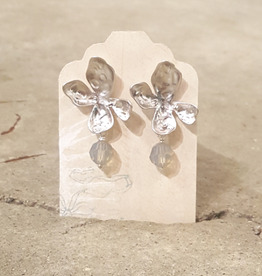 These modern stud earrings boast a teardrop shape with geometric detailing reminiscent of stained glass window frames. 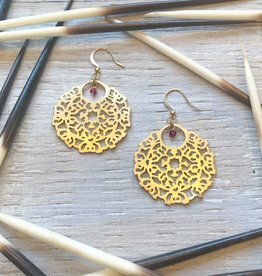 A small chunk of rough red Garnet adds a pop of colour and a hint of motion dangling from the bottom. 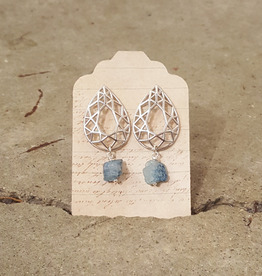 A small chunk of rough blue Apatite adds a pop of colour and a hint of motion dangling from the bottom. These super feminine studs combine elegance with summer fun. 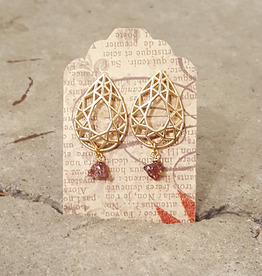 Gold plated rose outlines have an an almost fractal geometric quality to them, and the translucent Rose Quartz teardrops are bold yet delicate, just like a rose petal. 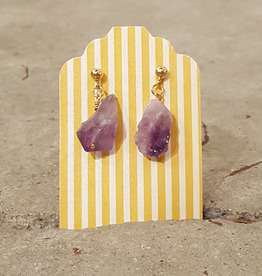 Revered in ancient times for its regal purple colour, Amethyst is still beautiful today. Feel grounded and magestic when you finish off an outfit with this textured pop of colour. 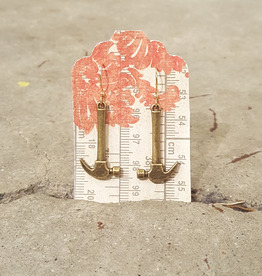 Tiny, simple brass hammers hang from gold plated hooks. A great subtle nod to your handy skills or just a fun quirky piece! 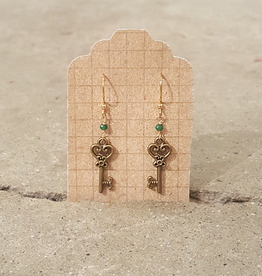 Dainty, ornate brass keys dangle from an emerald green Chinese crystal. 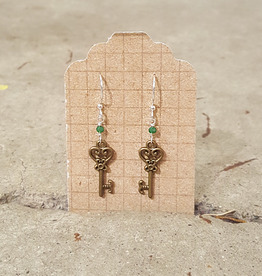 Perfect for unlocking magic locks and hidden doors! 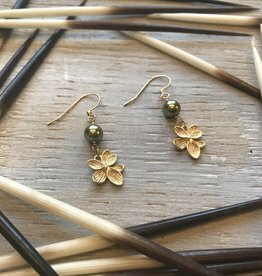 Delicate gold plated blooms dangle sweetly from rich green swarovski pearls. 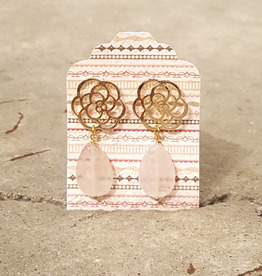 Keep a breath of spring with you year round with these dainty beauties. These have the feel of coral growing gloriously or a Buddhist wall adornment. They take me away. 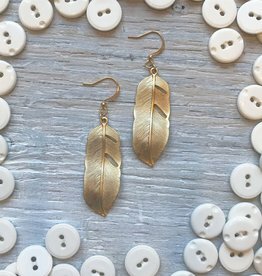 The Swarovski crystals give them a little extra sparkle like the shimmer off a pond.